No matter how long it takes, Mt. Vernon personal injury attorney ; Brian T. McGovern , will pursue compensation for his personal injury victims and Workers’ Compensation clients. If you have been injured on the job or seriously hurt in a car accident, he wants you to know that your case is in good hands while you focus on recovery. He has been practicing law in Mt. Vernon for 11 years, and is over 90% successful in getting financial compensation for his personal injury and Workers’ Compensation clients. With his assistant, Claudia Elliott, Brian T. McGovern, Esq. of Mt. Vernon provides personal attention to his clients in the nearby cities of Centralia, Fairfield, Nashville, Salem, McLeansboro, Flora and Benton. He has also helped clients in Carbondale, Marion and other parts of Southern Illinois. When you hire Brian T. McGovern to handle your personal injury case, you get a personal injury lawyer who is more concerned about his client’s healing than his own compensation. If your claim is initially denied, or you are having trouble getting a diagnosis, he will not abandon you. He will stick with you until you get paid for your medical care, lost wages, disability and other losses. Contact his law office today if you have been injured in the workplace, or injured in a car accident or collision with a commercial vehicle. He offers free consultations, including nights and weekends by appointment. 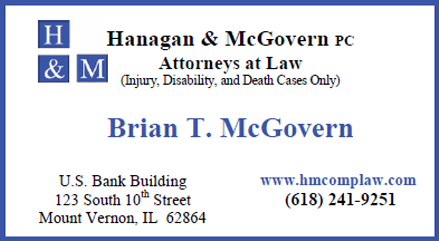 Brian T. McGovern, Esq., is an experienced southern Illinois attorney handling Workers Compensation and personal injury claims in Mt. Vernon, Centralia, Fairfield, Salem, Nashville, McLeansboro, Benton and Flora Illinois. Copyright © 2012 Hanagan & McGovern PC. All Rights Reserved.